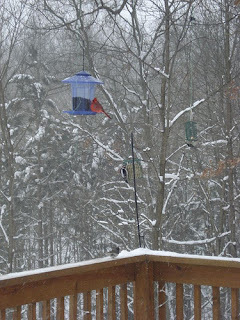 Right now I am looking out the front sliding doors at beautiful trees covered with snow; cardinals, junkos, finches and blue jays quickly eating on the bird feeders; and wind whipping everything. It is a wonderful white scene but step outside those doors and it is awakening with a temperature of 0 degrees and a wind chill of -25! I sure appreciate the warmth and comfort of our house on a day like this one. I plowed the driveway with my small John Deere for a third time in 48 hours (the banks on the side are now higher than my plow) and shoveled the deck and steps too! Quite a job but I enjoy the exercise and getting outside is ok as long as I have on the right clothes. We lived in many areas with less severe winters and one known for its frequent storms. We also have been in hurricane and tornado prone areas. I remember one Lubbock, TX storm that left hail stacked more than a foot high against our house and it was 80 degrees out! It didn’t melt for the entire day after the early morning storm. Then there were the dust storms in Lubbock in the spring that we called our “neighbors visiting from New Mexico”! When it rained during them we had flying mud, too! J We had the oppressive summer heat in Nevada and the tropical humidity in Panama! The 65,000 foot high thunderstorms in Panama were very impressive and could fill a drain ditch 5 feet deep in 5 minutes! During the rainy season they arrived every afternoon about one o’clock like they were on a schedule. After the first one, this Midwesterner thought, “hey, it will cool off now!” Boy, was I ever wrong about that! The rain just raised the humidity and made the heat index almost oppressive. Thank goodness for the base pool and ocean nearby! I am a Weather Channel junkie on occasion and part of the reason is that I like to see what the weather is like in places we have previously lived or visited. We always found ways to enjoy the area despite the particular challenges and/or benefits of its weather! We slid down “Dead Man’s Hill” when it was icy and road the waves when it was hot! We hiked and skied the mountains and explored the plains with a vigor that military families seem to have! Have you found a way to enjoy your current assignment despite the challenges of its weather (or maybe advantages)? Tell us about them so we can share with our readers and you can have a positive impact on someone else and their lives! Maybe they are getting ready to PCS and would like to know about their future home—your current location!